This weekend, Hollywood honors its best, but for the first time since Thanksgiving weekend, it's likely that three films could finish over $20 million each at the box office. The surprising thing is that this isn't May; blockbusters are finally making their way in great numbers to the first part of the year. Gone is the time when a movie can be dismissed by the time of year it's released. The Blade series doesn't seem like the most likely candidate for a franchise; despite a brief period in the early '90s, Wesley Snipes has never been particularly effective as an action star. The character Blade is also not a hero that had broken mainstream consciousness before the 1998 release of the first movie, which started with a respectable $17 million opening and continued on to $70 million total. However, a new model for franchises has developed in the past few years, that of capitalizing on a successful video/DVD release and launching a sequel based on that audience. In the case of Blade, its video take isn't particularly impressive at $29 million. The strength here is the DVD release, which is one of the more popular out there. This is a similar situation as with The Mummy and Austin Powers (which, surprisingly, had a rental tally well under $30 million). This means nothing without a saleable product, which Blade II should deliver. High-energy ads, starting with a teaser placed on the Lord of the Rings, have given a tremendous amount of exposure for the film, promising gore galore. New Line has also given it the full blockbuster treatment, with countdown ads leading up to its release. This is a relatively expensive proposition, since it requires new ads for each day and indicates a high degree of confidence in the product from the studio. Resident Evil shows that the market is receptive to this kind of action, and its $17.7 million has to be seen as a baseline. I feel this is going to do much better, however, and a weekend of $30 million may be in store. This gives it an excellent chance to take the number one spot for the weekend. The widest new release of the weekend is an old release, as ET makes a return to theaters for a 20th-anniversary release. Steven Spielberg has picked up the tinkering bug from George Lucas and has added new scenes and updated the visuals and sound. This has been the standard practice now for re-issues, at least since the Star Wars re-releases of 1997. The Exorcist added several scenes for its re-issue in 2000, and Apocalypse Now became Apocalypse Now Redux last year. Of course, neither of these two films exists on the same tier as the glowing-fingered one. The important issue here is the recent success of nearly every film that is viewed as "safe for the family." Since ET is more-or-less a proven product, it should be a popular choice among families as it gets passed on to a new generation. That said, it will have nowhere near the Gen X nostalgia supporting it that the Star Wars films induced. Its luster has faded as a touchstone film over the years, and I don't think it will attract that many childless viewers. Very early into Friday, it will pass the $400 million total all-time, and I expect $22 million this weekend for it to push well past this mark. Some re-issues have faded very quickly, but if it does hold on to make at least $60 million total, it will push past Star Wars into second place all-time, passing an old rival at the box office for a second time. Sorority Boys becomes the also-ran this weekend. Although it belongs to such a "classic" genre as the college/high-school cross-dressing comedy, joining such illustrious films as Just One of the Guys and Nobody's Perfect (starring Chad Lowe), it will have a hard time living up even to those dim highlights. Skirting the issue of star power entirely, they've chosen the route of TV actors and one B-grade comedian for the three "women" (and Harland Williams makes one ugly woman). Even at that, you'd be hard-pressed to nail down who these guys are, being in disguise as they are. All in all, you couldn't drag me to this movie. Much like the recent Slackers, it will be lucky to make an impression so that it becomes a familiar title when it comes around for a cheap rental. $4 million is a positive enough result for this, and let's hope no encouragement comes forth for the makers of this film. Ice Age's very strong showing last weekend proves just what a strong commodity CG animation has become. All of the studios interested in launching animation studios - if there still are any that are interested - will now default to hiring or creating their own CGI branch to create a successful division, much to the chagrin of traditional-animation fans. As far as its legs go, Shrek and Monsters, Inc. last year both managed, despite large opening weekends, to carry extremely well in their second weekend. Ice Age hasn't had quite the reception of either of those two films, but even with direct family film competition from ET, I see no real obstacle in the way of another strong weekend for Fox's cast of critters. It should be a close battle between this and Blade II for the top spot, as I expect Ice Age's second weekend to fall right in the same range of $30-32 million. A model for Resident Evil's performance after week one may be Jet Li's Romeo Must Die, which started with $18.0 million but wasn't able to expand beyond a core group of action fans. That film dropped 48% in its second weekend and ended with a $56 million total. Reception among the core audience has been similar for both films, with slams coming from anyone not immediately in this group. 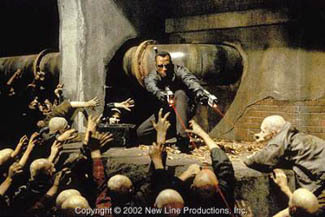 Combined with the early adopting nature of this genre, I predict a similar fate for the zombie hunters of Raccoon City. If it follows this pattern, expect about $10 million for the second weekend. Showtime, on the other hand, didn't seem to please much of anyone; its $15 million take for last weekend seems generous considering its ad campaign. It shouldn't be as naturally front-loaded as Resident Evil, but should see at least a 45% drop. With big stars, if there's not a big opening, the sharks in the water smell the blood.